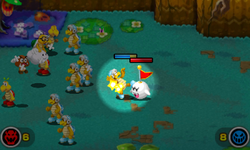 Superstar Saga + Bowser's Minions Description A stealthy attack from behind an enemy captain. Can it be pulled off against types you're weak to? Sneak Attack is the eleventh captain command in the Minion Quest: The Search for Bowser mode of Mario & Luigi: Superstar Saga + Bowser's Minions. It costs six CP to use. When used, the captain will sneak up behind the opposing captain and attack them prematurely. Captain Boo, Boos, Magikoopas, and Big Boos are the only ones that can use it. Sneak Attack reappears in Mario & Luigi: Bowser's Inside Story + Bowser Jr.'s Journey, and it is a first officer command usable by Kamek. This page was last edited on January 26, 2019, at 15:44.